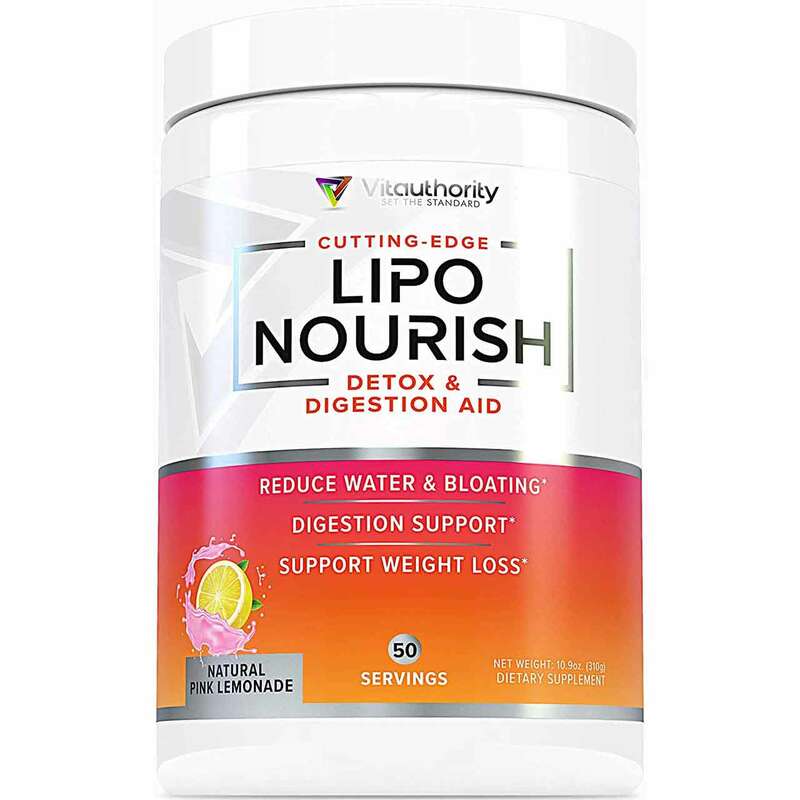 Vitauthority Lipo Nourish Review | Buy or a Scam? Lipo Nourish is a powdered supplement that you add to water in order to make a drink. It is advertised as good for health and for weight loss, with lots of key features mentioned in the advertising such as belly bloat reduction and natural detox and liver health support. Lipo Nourish is available in a choice of two flavours; watermelon or pink lemonade. The ingredients information is provided and includes B vitamins, chromium, and digestive enzymes. No comments Published Mar 26, 2019. Lipo Nourish is a weight loss powder that you add to water to make a pink lemonade or watermelon flavoured drink. According to the advertising, it detoxifies as well as improves gut health and weight loss. So, let’s find out more about this multi-faceted supplement! There is very little background info to Vitauthority. You can only contact the company via email or Facebook. According to the “about us” information, Vitauthority is a “science and quality-driven health & wellness company who strives to be the customer’s absolute authority when it comes to high-quality health and nutrition products”. Lipo Nourish is touted as a health and weight loss drink. It is sold in powdered form and is available in two flavours; pink lemonade or watermelon. Each tub contains 310 g (10.9oz), which is sufficient for 50 servings (25 days supply) if you take as directed. The principle ingredients are choline bitartrate and Inositol rather than the apple cider vinegar mentioned in the advertising, so if you are looking for just a cider vinegar supplement this will not be suitable. Lipo Nourish comes from a shadowy company called Vitauthority, who claim to be nutritional experts but provide no proof to back this up. There is also no evidence that this supplement was manufactured in the USA. What are the side effects of Vitauthority Lipo Nourish? Lipo Nourish may cause a wide range of side effects. These may include sleepiness, sun sensitivity, tingling sensation, headaches, upset stomach, stomach pain, nausea, dizziness, changes to blood pressure, diarrhoea, fishy body odour, changes to blood sugar levels, dehydration, and allergic reaction. Speak to your doctor before use if you have an underlying physical or mental health condition. Also, take medical advice if you are using prescription medication because some of the ingredients may cause interactions. Cease use in the case of an allergic reaction and experience side effects such as itchiness or hives, swelling, or difficulty in breathing, and seek medical advice, remembering to take the canister with you. 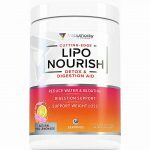 How much does Vitauthority Lipo Nourish cost? Lipo Nourish is expensive. Buy from the Vitauthority website and it costs $34.99 for a tub of 50 servings (25 days supply). Shipping costs are applied at the point of sale. You can also buy Lipo Nourish via Amazon for the same price. Lipo Nourish is a powdered supplement that you add to water in order to make a drink. It is advertised as good for health and for weight loss, with lots of key features mentioned in the advertising such as “reduce belly bloat” and “support natural detox and liver health” and more. Lipo Nourish is available in a choice of two flavours; watermelon or pink lemonade. The ingredients information is provided and includes B vitamins, chromium, and digestive enzymes. Lipo Nourish also contains Inositol – a vitamin type substance derived from plants when taken in supplements, but also present in the body. It contains Choline Bitartrate and there are some amino acids too. In addition, there are a couple of herbal extracts in Lipo Nourish. These are Juniper – a berry best known as the flavouring in Gin and there is Apple Cider Vinegar which is becoming increasingly popular as a supplement ingredient. All ingredient quantities are provided. Check out the ingredients section to find out more. There is no background information for Vitauthority. In the “about us” details, the company promote themselves as self-styled nutritional experts and authorities with years of dietary supplement experience behind them. This would be more convincing had the company provided some details, such as names and qualifications and a proper address. Despite the claims of being leading authorities in the supplements world, we had not heard of Vitauthority before. We checked the company out on Facebook and found that the company was founded in 2018 and has around 7000 likes. We also found that there are no customer complaints online regarding scams or similar. We did manage to find one address. This is on the Lipo Nourish bottle and provided as 7201 Frankford Ave #949 Philadelphia, PA 19135. We found that this was just a distribution centre so wherever this company are operating from – and all those so-called dietary experts MUST be somewhere, it is not at this location. What does Vitauthority Lipo Nourish claim to do? The Vitauthority website is slick and professional looking, with some glossy stock photos of beautiful people doing exercise. This sounds good, although we did notice a lot of grammatical errors dotted all over the website and the Amazon advert which spoiled the otherwise good impression. In addition, it would have been more convincing had Vitauthority revealed some details about themselves and provided only a distribution centre as an address. Does Vitauthority Lipo Nourish work? Lipo Nourish looks unpredictable. The detox side of the supplement is provided by juniper berry which is a well-known diuretic, so it will probably make you pee more frequently. This may help with the issue of water retention but can also lead to dehydration. Taking water tablets may make you look temporarily slimmer but is not a long lasting or healthy effect. The other ingredients are also questionable. Some animal testing suggests that L Carnitine and Choline combined may help weight loss. The downside is that clinical testing has always included added caffeine and that this theory has only been tested so far on animals. Apple cider vinegar is currently being touted for just about everything to do with weight loss, such as reducing cholesterol and appetite as well as belly fat. The problem is that all research has been carried out using the natural vinegar rather than taking it in dried form as here. In our opinion, this drink would have been more effective had the product information advised you to add a teaspoon to cider vinegar to the mix! The basic issue with this supplement is that nothing is proven. And with a lot of ingredients which may or may not work, the high quantities of the B vitamins, and along with the risk of potential side effects, we would be quite nervous about this so-called health drink! The most popular consumer choice in 2019 is Phentaslim. With a combination of proven ingredients, superb customer service and a 60-day money-back guarantee, Phentaslim is making big waves in the diet world. Find out why thousands of people are choosing Phentaslim to achieve their weight loss goals, and why it's also the editor's top selection. Read the Watchdog Phentaslim review here. Serving size is equal to one 6.2g scoop of powder. Vitamin B6 (20mg): Important for brain health and the nervous system, B6 is involved in many processes in the body, mainly concerned with the metabolism of proteins. Serving size is way over the recommended daily allowance of 1.7mg. Vitamin B 12 (500mcg): Vitamin B12 is essential to the body and is only obtainable by diet. It is present in animal-derived products such as meat, fish, and, dairy, so deficiency can be common in people with restrictive diets such as vegans. It is important for many purposes including brain function, healthy blood cells, and the nervous system. Serving size here is way over the RDA of 2.4mcg. Chromium Picolinate (20mcg): Chromium Picolinate is the type of chromium, a trace mineral, most commonly used in supplements. It may help the way the body uses insulin and can help control blood sugar levels in people with diabetes. Choline Bitartrate (1000mg): Choline is a natural B vitamin type substance produced in the body, but we obtain most of the choline we need by diet where it is in eggs, veg, and dairy products. Choline is important for the nervous system and for cell health. Some evidence suggests it may improve lipid metabolism by helping transport fats from the liver. Other claims are that it combines well for weight loss with Carnitine – also present in this supplement. Inositol (1000mg): Also known as vitamin B8, Inositol is present in plants and animals as well as the human body where it is produced from carbs. It is important for insulin function, a hormone that regulates blood sugar and it may be effective for treating diabetes. However, is most commonly used for mental health issues such as panic attacks or depression. L Carnitine L Tartrate (500mg): Supplement form of amino acid Carnitine. Carnitine plays an important role in energy production, so is often taken by athletes and bodybuilders to improve endurance and strength. Animal research suggests that when combined with choline and caffeine it may help increase weight loss, but there does not seem to be any human studies. Juniper Berry (200mg): We all love juniper berries, especially in gin because it is this popular spirit’s main ingredient. Juniper berries have a diuretic effect so will increase urination. Amylase (200mg): Amalyse is a digestive enzyme which means that it helps the body breakdown nutrients. Amalyse is in the saliva and acts on starch which it breaks it down into carbohydrate molecules. Bromelain (200mg): Enzyme derived from pineapple. It is not a digestive enzyme but is meant to prevent inflammation throughout the body, although it lacks real evidence. Lipase (200mg): Digestive enzyme that helps the body to break down dietary fats. Protease (200mg): Digestive enzyme that helps the body break down dietary protein. Not suitable for individuals under 18. Avoid if you are breastfeeding or pregnant. Some of the ingredients may cause interactions so check with your doctor before use if you are taking prescription medication. Speak to your doctor before use if you have an underlying physical or mental health condition. Discontinue use in the case of an allergic reaction and seek medical advice. There are a handful of reviews on Amazon. Most customer feedback is positive. Some customers are using this supplement on a permanent basis. Love this product! I’ve been using it for 6 months, twice a day and it’s a game changer! Definitely give it a try! One customer was attracted by the cider vinegar content. Other customers are using it as detox. Talk about detox cleansing. Oh yes this is the product for it. Pink lemonade tastes super yummy too. This customer did not like the taste. I wish this came unsweetened. I am not a fan of stevia, to me it tastes like artificial sweetener. There is no money-back guarantee for Lipo Nourish. You can buy Lipo Nourish directly from the Vitauthority website. It is also on sale via Amazon. We don’t trust Lipo Nourish! Some of the ingredients in this powder seem very questionable, and we can’t understand why this company has chosen to use such a high serving size of B6 and B12 when most vitamin supplements use only a fraction of the Lipo Nourish serving size. In our opinion, side effects to the many ingredients are likely to be a problem, despite the fact that the product information makes a point of mentioning there is no caffeine. In addition, we are suspicious of the claims made by the advertising. None of them seems to add up, although you may find it does increase the amount you pee thanks to the juniper berry. Frankly, we are suspicious of Vitauthority. This company has managed to keep its location completely secret, and the only real address we could find was the address of a distribution centre. Vitauthority claims to be an authority on supplements, but how can we believe this when they don’t even tell us where or who they are? This also means there is no guarantee or returns policy. Overall, we do not recommend Lipo Nourish to the Watchdog readers. How does Vitauthority Lipo Nourish compare to Phentaslim? Jane has been passionately involved in the diet and supplement industry for a number of years, with an impressive track record covering over 4000 products. An early grounding in food science gives Jane the necessary knowledge to objectively analyze, and a love of coffee gives her the edge when deadlines need to be met.